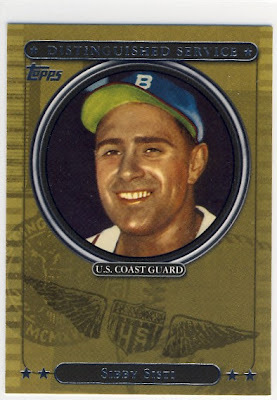 A few weeks ago on Twitter, as he usually does, Beckett Baseball editor Chris Olds was tweeting random photos from his personal card collection. 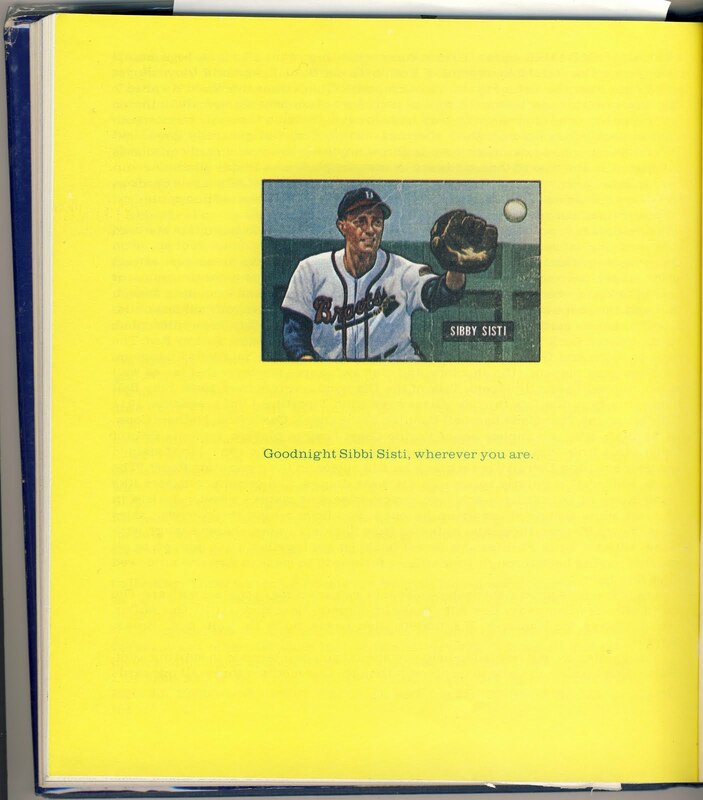 There was one photo of pages and pages of Jose Canseco's Donruss rookie card. It got me thinking about my own collection and why I don't really do that sort of collecting. Sure, I collect players but there are only a few cards that I actively search for again and again. One of these cards would be the 1986 Topps Kirby Puckett. My fascination with that card stems from a random day when my I was at a card shop when I was about 12 and splurged and bought an old '86 wax pack for $5.00 [those were the days]. I was/am a huge Twins fan and so pulling my first copy of that card was earth shattering for me. 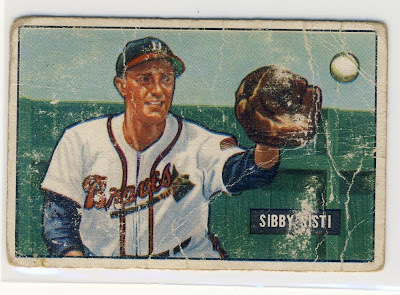 Which brings us to one of my All-Time Top 10 Cards [In Particular Order]: the 1951 Bowman card for Sibby Sisti. Sibby is a little known outfielder for the Milwaukee Braves. Sisti was never what you would call a great player...he had a career batting average of .244 and had a career high number of homers  and RBIs  in 1941. 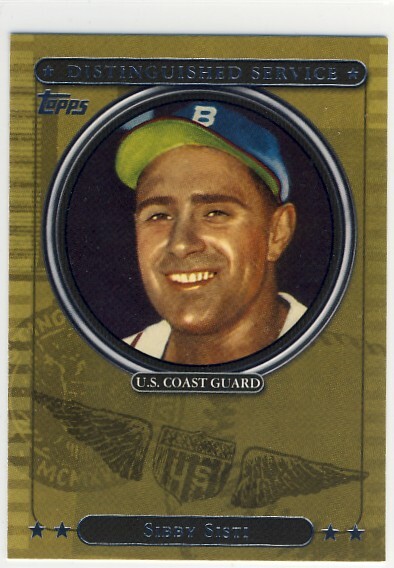 Sibby also lost the 1943, 1944, and 1945 season due to his service in the Coast Guard during World War II. Sibby's 1951 Bowman card first entered my life through the famous Flipping and Trading book. I've been working on a project for a few years to get a copy of every card highlighted in that book and Sibby's card is found on the very last page with the caption "Goodnight Sibby Sisti, where ever you are." There is just so much to love about Sibby's card. He's got that great old glove. Plus, it is an action shot...not the greatest action shot ever but an A+ action shot for the '51 Bowman set. 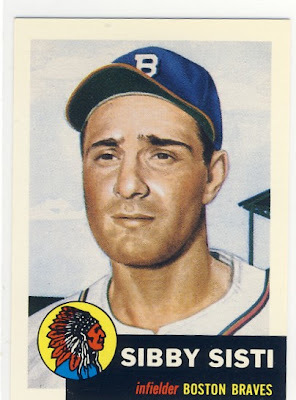 If you've got the time do an image search of "1951 Bowman" and see how many of those cards of just of the player standing there. And then there is the fence. It's not really the kind of fence you would expect to see at a major league ball park, it's more like a back yard fence. You might look out your back window think, "oh look, Sibby Sisti is playing catch in the backyard." So far I've got three copies of the card ranging from poor to what I would call very good. None have been graded and I've gotten all of them through eBay. I'm always on the look out for more so if you have one you are willing to part with just let me know. 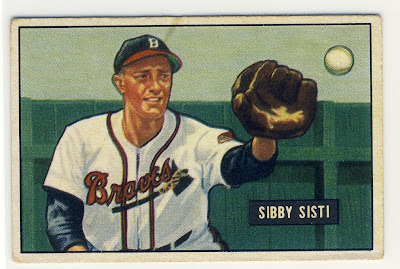 Here are a few of the more recent Sisti cards including one of the Distinguished Service inserts from 2007 Topps honoring Sibby's military service. Sibby has what I think is the best card of 2010 in this year's Obak set.